Genuine Old Tibetan Necktar DZI Antique DZI Bracelet. This necktar dzi was collected for many years. 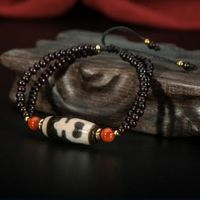 DZI Bead, onyx beads. DZI Bead size: 27mm*11mm.